Join us for our October meeting as Tom Beckman explores his Extreme Reversal System. Tom’s system attempts to define market extremes for swing trading through a variety of indicators: oscillators, emas, levels, and breadth data. Once an extreme has been determined, I then time the entry using short term factors. Exit criteria are also covered. The long term investing context considers whether we are in a bull, bear, or trading phase. In addition, it examines fundamental and economic factors to improve trading success. Due to a higher priority commitment, our previously scheduled speaker, Carl Perthel, had to step down from his November presentation. Once he is again available, we will schedule Carl for his fascinating historic market perspective presentation. Members may pay dues by check or cash at the meeting ($45), by credit card at the meeting ($47 total using our mobile reader), or on the SMT web site ($47) using either a credit card or PayPal. Web site and credit card payments are an additional $2 to cover SMT online banking costs. Dues increased to $45 in 2018. New members may join at anytime for the same due and their membership will be valid to 12 months after the date of payment. A reminder, our meeting will be held in the downstairs social hall and we will have high speed WiFi available. SMT logo coffee mugs will be available for purchase at the meeting, $5 for members, $7.50 for non-members. 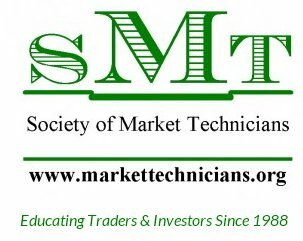 If you are a member and have not picked up your SMT lapel pin, see Sondra Katz at the meeting. The new SMT logo Power Bricks will be available for sale to members for $15, $17.50 for non-members. We will also have the new SMT logo golf shirts, for $25. Carolann Brown, (CFP), UBS Financial Services, Inc.